Tachycardia, or a rapid heart rate, can be caused by a variety of disorders that affect the heart, blood vessels or even the nervous system. Whether acute or chronic, tachycardia can cause life-threatening consequences. Treatments aim to slow down the heart and prevent any permanent damage to the patient. Patients experiencing an episode of tachycardia may be asked to perform vagal maneuvers by their doctors, reports MayoClinic.com. Vagal maneuvers are a set of voluntary physiologic actions that affect the vagus nerve, which is a nerve that helps regulate the heart rate. Vagal maneuvers include bearing down as if defecating, coughing and placing an icepack on the patient’s face. As the vagal nerve is stimulated, the rapid heart rate begins to slow. Doctors sometimes prescribe anti-arrhythmic drugs to patients with a rapid heart rate, states the American Heart Association. These drugs are used to slow down the heart by affecting the cells that control the heart rate. Examples of anti-arrhythmic drugs include procainamide, lidocaine and bretylium. These drugs can have serious side effects, and patients taking them should be monitored carefully. In severe cases of tachycardia, doctors may decide to perform external cardioversion in order to force the heart to return to a normal rate and rhythm, according to MayoClinic.com. External cardioversion is a procedure that delivers an electric shock to the patient’s heart through patches or paddles placed on the chest. The electrical current affects the impulses controlling the heart rate. 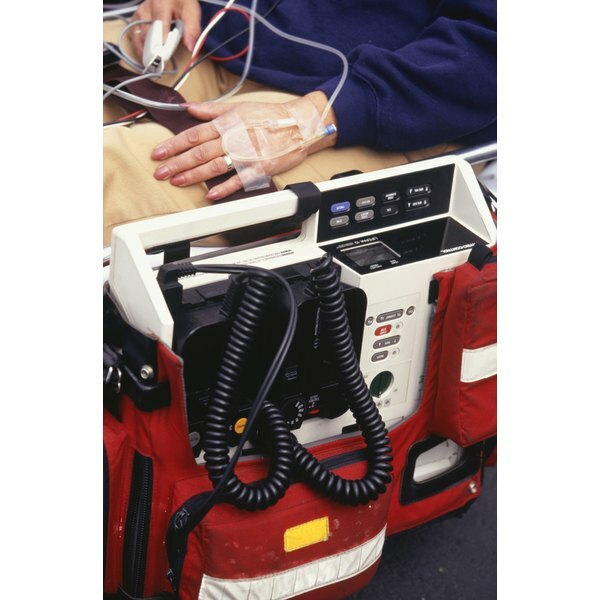 External cardioversion is used in emergency cases where medications or vagal maneuvers are not effective. An implantable cardioverter defibrillator, or ICD, is a device that can be placed in a patient’s chest to control the heart rate. This is very useful in treating chronic cases of a rapid heart rate, according to MedlinePlus. The ICD is like a pacemaker that is placed in the upper left part of the patient’s chest. The device is attached to the heart via a set of wires, and is programmed to sense when a patient is suffering from tachycardia. When the device senses a rapid increase in heart rate, it sends out pulses that interrupt the tachycardia and restore the heart to a normal rhythm.